A smile not only makes you stand out amongst others, but a smile can also help your body function better. You may not know this, but a healthy smile could make you look younger, and it is considered one of the most fun ways to help you live longer. With facts like these, you should smile as much as you can. Smiling is not only good for your soul; it is great for your immune system. Smiling helps improve your immune function; your body is more relaxed when you smile. A simple smile could not only make you feel great, but it could help prevent flu and colds. Each time you smile, you reduce your blood pressure. If you have a blood pressure monitor at home, you can test this statement out. Simply take a reading; after a few minutes, smile and take another reading. You will be able to notice the difference. It is true that smiling releases endorphins, in addition to serotonin and natural painkillers. When you combine those three, a small smile becomes a natural drug that makes you feel great. When you smile, you are more likely to feel positive. The next time a negative thought or situation occurs, smile. With each smile, you are sending your body a signal that life is great. So smile with your heart, and stay away from depression or stress. Smile as much as you can because it is contagious. 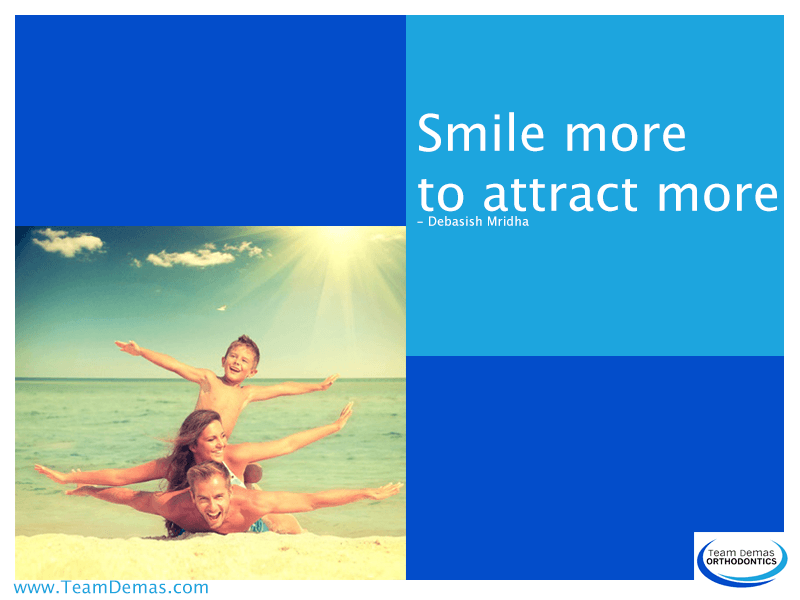 When you smile, you attract smiling people, which can be a big mood booster. Your smile changes the mood of others and truly lights up a room. The more you smile, the more confident you will feel. If your teeth are keeping you from smiling, you should schedule an appointment with Team Demas Orthodontics. We have an office in Southington, CT, and can provide all of your orthodontic needs. Life is too short not to smile, which is why you should smile from the heart!